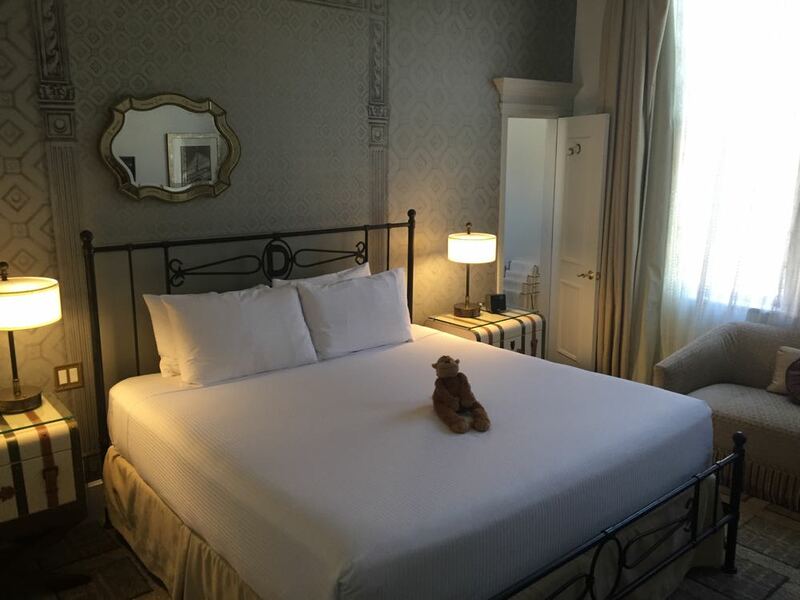 Home » Hotels » Hyatt » Review: The Driskill Hotel, Is room 525 Haunted? I’d planned a surprise trip for my girlfriend for her birthday. She had absolutely no idea where we were going, or that we were even flying somewhere. I thought it would be fun to go to Austin over a football weekend and also try out a couple hotels. Make it a bit of a luxurious, hotel gypsy holiday. 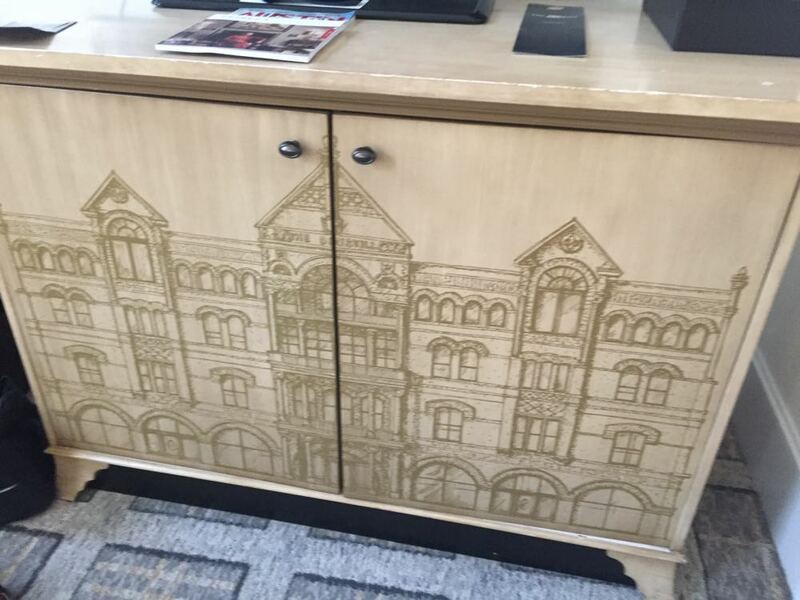 I’ve long admired The Driskill hotel from afar, following it’s absorption into the Unbound Collection by Hyatt. It’s the oldest hotel in Austin, second in Texas, and extremely well located at 6th and Congress. What transpired over our one night stay was unique to say the least, but sent us running to the hills. 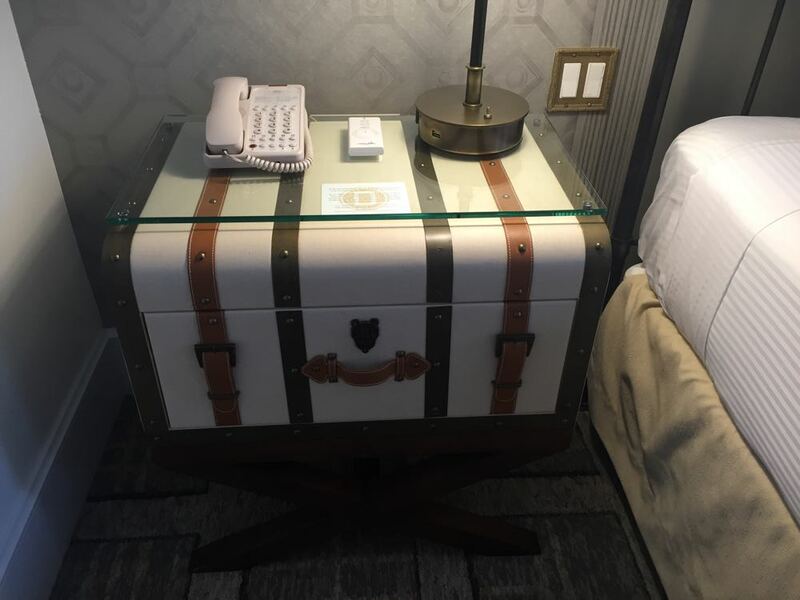 Well, the JW Marriott exactly, but it left us wondering: Is room 525 Haunted? As you can see from the picture below, the hotel is GRAND. I love old historic hotels, as does my girlfriend, and we were both VERY excited to settle in and go check out Austin. The desk clerk that checked us in was absolutely wonderful. She asked if we were celebrating any special occasion and I told her yes that we were celebrating a birthday and on a surprise trip. She was so excited that it was all a surprise and wanted to send up some champagne to the room, and also put us in a King room vs the Queen room that we had used the Points and Cash rate to book. Obviously we said YES YES YES YES PLEASE AND THANK YOU! She gave us our room key and said she had upgraded us to room 525. She also mentioned that the hotel had a “lore” to it and that the nearest elevator was the haunted elevator. We didn’t really pay much attention to it, but it is VERY old and teeny tiny. The hallways are long, short, and feel of another era. There are also lots of hanging memorabilia and OLD paintings. These LONG hallways will be something to keep in mind as the story unfolds. We arrived at Room 525. The rooms here are very small. In fact, everything about the hotel throws back to a bygone era. 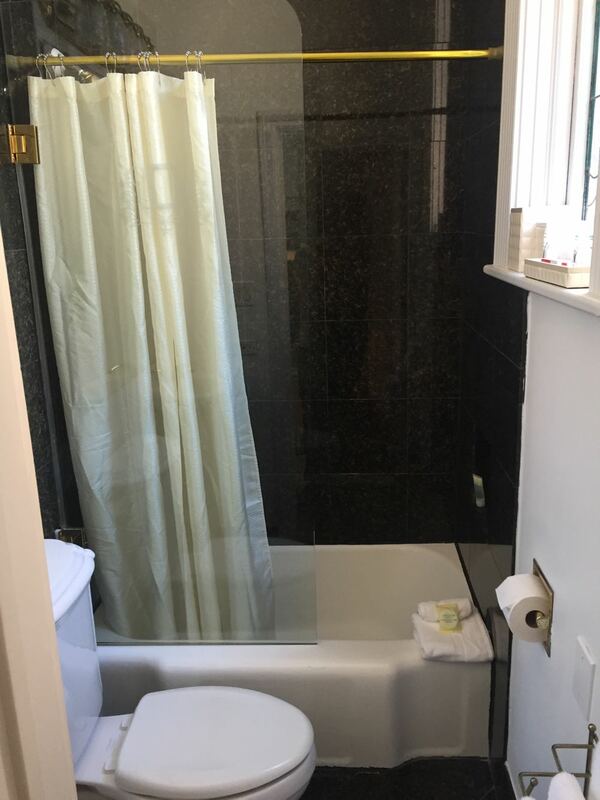 You can tell the average person must have been much smaller in build as everything is tailored for guests of smaller stature. I loved the whole “feel” of the hotel and is totally different from anything you’ll find in a standard luxury hotel. We noticed an odd “cleaning product or chlorine like” smell when we entered the room. We really didn’t think much of it and once you’re in the room for a bit…it goes unnoticed. The hotel is lovely and kind of fit exactly what I was looking for, in terms of a surprise, for my girlfriend. We spent the rest of the afternoon wandering around Austin. We came back and as we were getting ready for dinner I nipped out to take a few other pics of the property. Heading out to Dinner. So here’s where things got a bit strange. We didn’t really know what to do as we had no idea that our room was supposedly “Haunted.” I almost thought this was some sort of a prank. I mean how did she just happen to be outside our door as we were leaving? So we just smiled and said,” are you serious?” She was alllll about room 525 lemme tell you. Told us that there had been television programs on our room and how much she loved stuff like “that.” The lady even offered to switch rooms with us…she said she was staying in a corner room. Neither me nor my girlfriend were really in the mood for an “experience” whatever that might entail and so we thanked her and said we would think about it. We then hopped in the “haunted” elevator and immediately started googling. We read several articles specifically written about the Driskill Hotel Room 525 haunting. As the stories go… couple of brides had committed suicide in the bathroom on the same day, but in different years. There have been apparition sightings, etc, etc. Lemme just put this put there…Miles doesn’t not vibe with hauntings or spirits. Bar none. We explained the entire situation and our reservations to staying in the room to the front desk manager. The lady. The Haunting rumors, etc. What was the most befuddling was the fact that this room was an UPGRADE. I mean, it’s almost comical. The lady that upgraded us was so nice and generous that I don’t think it even crossed her mind that we may not be into the whole “experience.” We basically asked the front desk if there were any other rooms available. The hotel didn’t have anything else in our room “type” and we just agreed to go use our free drink coupons to grab a drink at the bar and then head to dinner and have a think. It’s an amazing bar. Beautiful, historic, and inviting. The mezcal margaritas gave us some confidence. We decided that we were going to enjoy our time, write off the non-sense about our room. We stopped by the bar again to order some food and have a celebratory drink ( as it was now my girlfriend’s actual bday) We were probably in there for 30 mins or so. We decided to take our food up to the room. I think both of us were kind of wondering if something was going to happen, but neither of us said a word. We order a movie. I’m exhausted and about 30 mins into the movie I start to nod off. It’s at this point that the overhead lights start to flicker. Now, it’s a 130 year old hotel, and little things like this are bound to happen. I told myself, ” no biggie.” We also had our bedside lamp on that wasn’t flickering. Eh…no big deal. As I’m nodding off the lights flicker again. At this point, knowing all the rumors about the room, the hair on my arms starts to raise up. 3 more times the overhead lights flicker. I sit up in bed. My girlfriend isn’t saying a thing, just shaking her head no no no. 5 times the lights flickered. Then, out of nowhere we hear 5 LOUD KNOCKS at the door. Both of us just look at each other. OH HAIL NO! I hop out of bed and go to the door. No one at the peephole so I open. No One. My instinct is that someone is messing with us, but this is freaky. The halls are empty. No doors close. The hallways are long. No one is snickering or laughing at pranking us. I walk into the hall to get a better look. Still nothing. I step back in the room. My girlfriend is already packing. I call downstairs to ask if we can switch rooms. Their response is that the systems are down. Maybe we are over-reacting, but someONE or someTHING is messing with us. It’s 2am, we are tired, want to relax and celebrate. We wanted another room. Their systems are down as there is some sort of power issue going on downtown. Ok this explains the flickering, but why didn’t the bedside tables flicker? Still someone was knocking on the door, in the middle of the night, and we weren’t comfortable staying especially after we brought the issues up to front desk manager earlier in the evening. The night staff could not help us. So my girlfriend and I phone over to the JW Marriott and booked a room. We requested taxis to take us, but the bars had just let out and there wasn’t any way to get us a taxi. We ended up leaving our hotel in the middle of the night. WHAT a story. Who knows what happened, if it was a staff member, that lady, or a random guest being rowdy, but the result was we were going to end up staying in 3 hotels in 2 nights. For Miles and I this was a dream. We are Hotel junkies, but this was my girlfriend’s birthday and this was not what we had hope for as a surprise. I spoke to the same front desk manager that I had spoken to before dinner the prior night. He was SUPREMELY apologetic and wanted us to be assured that security, guest happiness, and our satisfaction was his utmost concern. I intimated that their hotel was great. I understood that this was a random occurrence, but nonetheless, we end up leaving their hotel in the middle of the night. Something that could have been avoided had we switched rooms earlier or informed prior to the upgrade that 525 had some “history” to it. His response was why I love Hyatt. He removed all charges from the room. Something that was more than what I expected. We had charged food to the room, etc and I thought that should be my responsibility, but would have liked the room and points to be refunded. His response was above and beyond. All charges removed. The refund on the points had not shown up so I wrote an email to gold passport. AGAIN Hyatt exceeded my expectations. The General Manager of the hotel personally reached out to me. He noted that the manager had put in the request for the points to be refunded but something had happened. He refunded the 10k and added another 5k for my troubles. He also invited my to visit the hotel as his guest and assured me that the second time around would be different. It was a very MEMORABLE experience. In fact, my girlfriend and I both laugh at it now. Thank goodness, because it was not a laughing matter as we drug out bags across town at 2am, zigzagging between and amongst UT students and the raucous remnants of the bars. Often times when things go wrong they become great memories and this is one of those for us. The hotel and it’s staff were amazing, and even though they couldn’t accommodate us in real time, they more than made up for it after the fact. I do believe that this was a unique experience pre-empted by someone’s impulse to scare/prank us. Security is an issue tho and the front desk manager, in his apology, said he had tried to find the lady and couldn’t. Who knows if it was her knocking, someone else, or maybe it’s a spirit, and if it is, I hope it stayed at the Driskill. Either way Hyatt and their management went above and beyond to make us feel good about the trip. 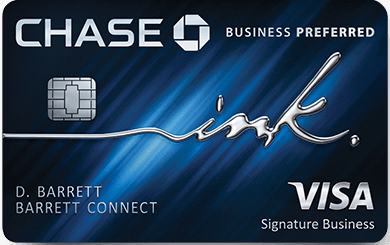 Next Article Rumor Update2: Is Amex’s announcement the TIER ONE? This is an awesome trip report. First of all the hotel is gorgeous but gives off the major creepy vibe. 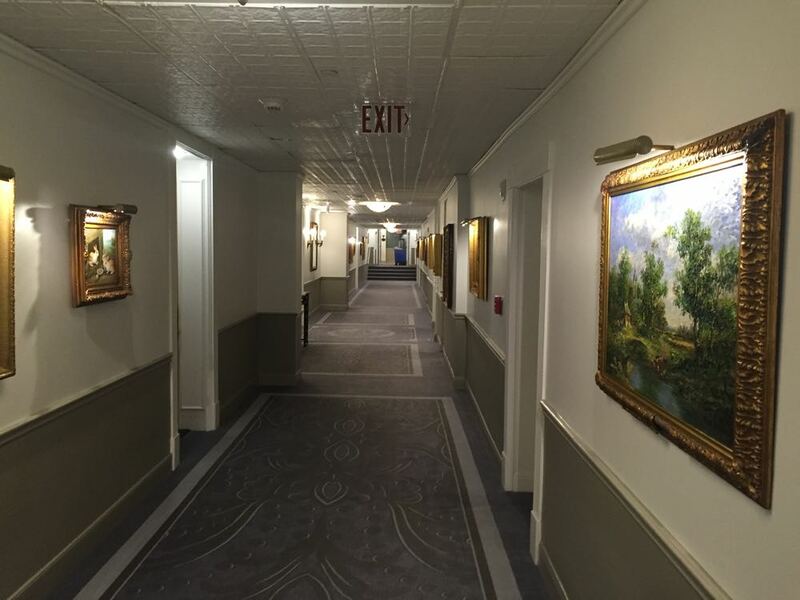 I’ve stayed at the Hollywood Roosevelt and actually heard a trumpet in the hallway – the hallway was empty. This was at 3am – it is apparently the ghost of Montgomery Clift who frequently makes appearances on the ninth floor. He stayed there and practiced his trumpet while filming From Here to Eternity. I also stayed several times at the Stanley Hotel (in The Shining) and there are cold spots and weird footsteps in empty hallways there. The Driskil has a Stanley Hotel vibe to it. I am glad the ghost didn’t kidnap Miles to another realm! If you stay at the Roosevelt there is supposedly the ghost of Marilyn Monroe the hangs out near the pool bungalows, too. ??? ?